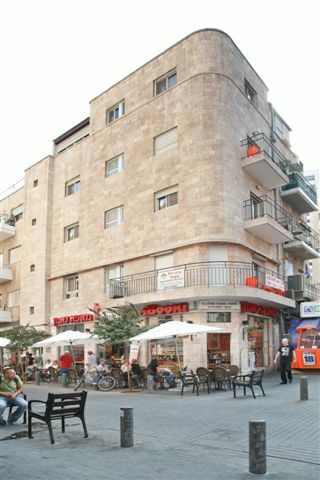 City Center is an apartment in Jerusalem set close to museums and churches. There is a bus stop nearby and Israel Museum, Church of All Nations and Dome of the Rock are easily accessible. A pedestrian area offers Note Dame Hotel cafe restaurant and George'z within 50 meters of the venue. 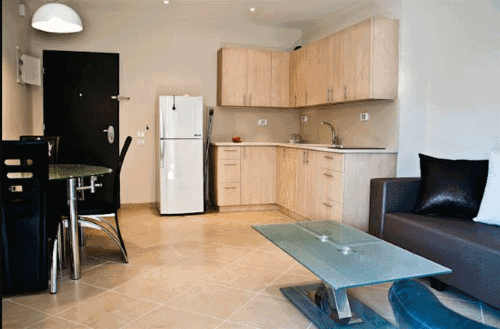 The apartment provides guests with Economy Wing Studio, Superior Wing Studio and Wing Studio. Room facilities include free Wi-Fi, an in-room safe, a seating area, climate control and a private balcony. The property is fitted with free toiletries and a hairdryer in a private bathroom. Guests can make use of a stove, a microwave, an electric kettle, coffee/tea makers and a fridge. 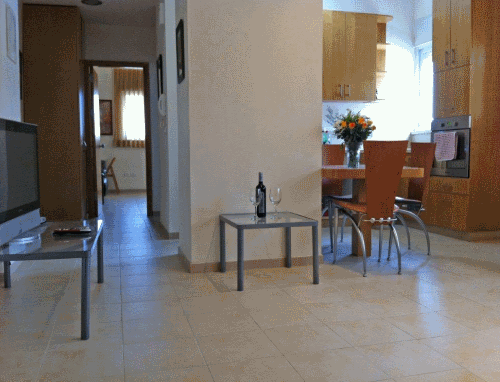 A short drive from Ben Gurion Intl airport. Leaving rooms at 11 (including Saturdays and holidays). Family Suite (One Bed Room Suite)50m2 ,Suitable for up to 5 guests ,1 bedroom with 2 single beds, cable T.V., closet with safe, and sofa; living room with a sofa that can be converted to a double bed; love-seat; dining table for 4; fully-equipped kitchen with electric oven, electric hob, large refrigerator, microwave, cutlery & crockery, electric kettle, toaster; air-conditioning; bathroom with bathtub and shower with towels, hair dryer, shampoo & soap. Free Wi-Fi and housekeeping service. Duplex Suite (38m2 Split LevelSuitable for up to 4 guests. 2 single beds, balcony on each level; a living level with a sofa that can be converted to a single bed; kitchenette with electric hob, large refrigerator, microwave or toaster oven, cutlery & crockery, electric kettle, toaster; air-conditioning; cable T.V. on each level; dining table for 4; iron and ironing board; shower room with towels, hair dryer, shampoo & soap; closet and safe. Free Wi-Fi and housekeeping service. All our units are fully furnished with kitchenette, air conditioning, free WIFI, cable TV, and daily housekeeping service. 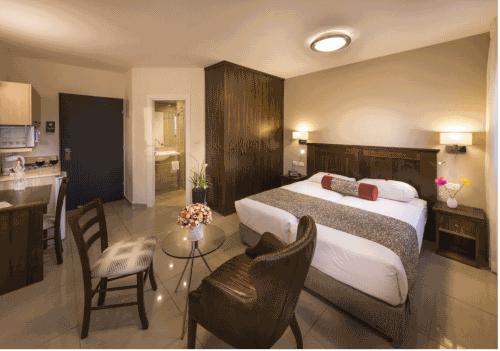 Suite (40 m2)Suitable for up to 4 guests. 2 single beds, a living room with a sofa that can be converted to a single bed; kitchenette with electric hob, refrigerator, microwave or toaster oven, cutlery & crockery, electric kettle, toaster; air-conditioning; cable T.V. in bedroom and living room; dining table for 4; iron and ironing board; shower room with towels, hair dryer, shampoo & soap; closetd safe. Free Wi-Fi and housekeeping service. All our units are fully furnished with kitchenette, air conditioning, free WIFI, cable TV, and daily housekeeping service. Superior Studio (22m2)2 single beds; balcony in some of the rooms, kitchenette with refrigerator, microwave or toaster oven, cutlery & crockery, electric kettle, toaster; air-conditioning; cable T.V., dining table for two; iron and ironing board; shower room with towels, hair dryer, shampoo & soap; closet and small safe. Free Wi-Fi and housekeeping service. All our units are fully furnished with kitchenette, air conditioning, free WIFI, cable TV, and daily housekeeping service. Studio Economy (16m2)2 single beds; kitchenette with refrigerator, microwave or toaster oven, cutlery & crockery, electric kettle, toaster; air-conditioning; cable T.V., dining table for two; iron and ironing board; shower room with towels, hair dryer, shampoo & soap; closet and small safe. Free Wi-Fi and housekeeping service. All our units are fully furnished with kitchenette, air conditioning, free WIFI, cable TV, and daily housekeeping service. 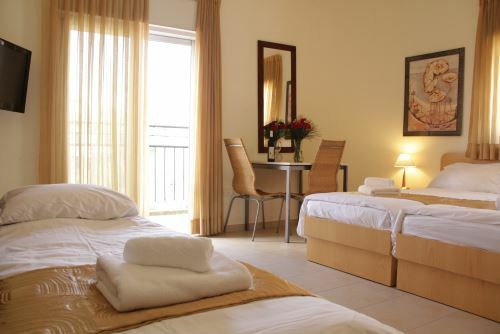 Studio Room (20m2) 2 single beds; kitchenette with refrigerator, microwave or toaster oven, cutlery & crockery, electric kettle, toaster; air-conditioning; cable T.V., dining table for two; iron and ironing board; shower room with towels, hair dryer, shampoo & soap; closet and small safe. Free Wi-Fi and daily housekeeping service. 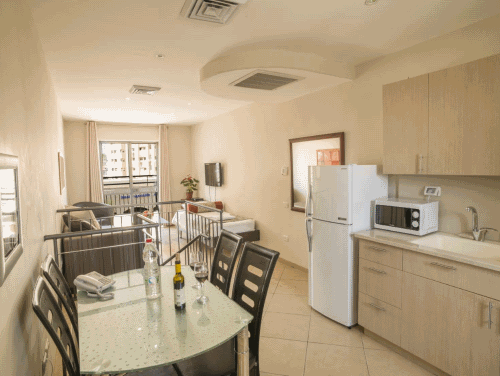 Deluxe Studio (32m2)2 single beds, a sofa that can be converted to a double bed; balcony with table and chairs; kitchenette with refrigerator, microwave or toaster oven, cutlery & crockery, electric kettle, toaster; air-conditioning; cable T.V. ; dining table; iron and ironing board; shower room with towels, hair dryer, shampoo & soap; closet and small safe. Free Wi-Fi and housekeeping service.